Since September 2007 two uncommon groups have been functioning at Kyiv kindergartens# 662 and 291, located at Obolon district. Both healthy children and “special” girls and boys (those who were born with Down syndrome) attend the named groups. Opening of first inclusive kindergartens in Ukraine became the result of preparation and training of such children conducted by specialists of “Ya Plus Semya” Center under the civic organization “In Children’s Palms”. The program was established due to the support and assistance of Main Education and Science Department of Kyiv City State Administration, Obolon District Education Department and many other people among all Ukraine who had aimed to care of children with special needs and helped to equip rooms for for Kyivan inclusive groups. Statistics proves that birth frequency of children with Down syndrome is 1: 1000 new born babies. Only in Kyiv 26-28 babies are given the birth every year. Just few years ago families who cared of children with DS were left alone with their troubles: such children used to be refused to attend community kindergartens, they even hardly ever were enrolled to schools for children with learning disabilities. All that took place due to the fact that children with DS were treated as unteachable or learning disabled. Specialists came to the conclusion that during long time real intellectual abilities of people with DS were underestimated. It's more difficult for them to learn how to speak and as they are usually isolated from ordinary children of the same age, their opportunities to acquire communication skills are limited. The emotional aspect of the difference between children with DS and their peers is positive: children with DS are kind, affectionate and cannot get offended at all. Communication with healthy peers is an essential need for a "special" child. Playing with ordinary age mates, a child with special needs not only learns to speak and to act as a healthy child, he (she) gets adapted to the normal way of life! And healthy children learn to accept their peers with DS such as they are. It help them to develop kindness, love for other people, empathy, altruism which are especially valued qualities at our time. 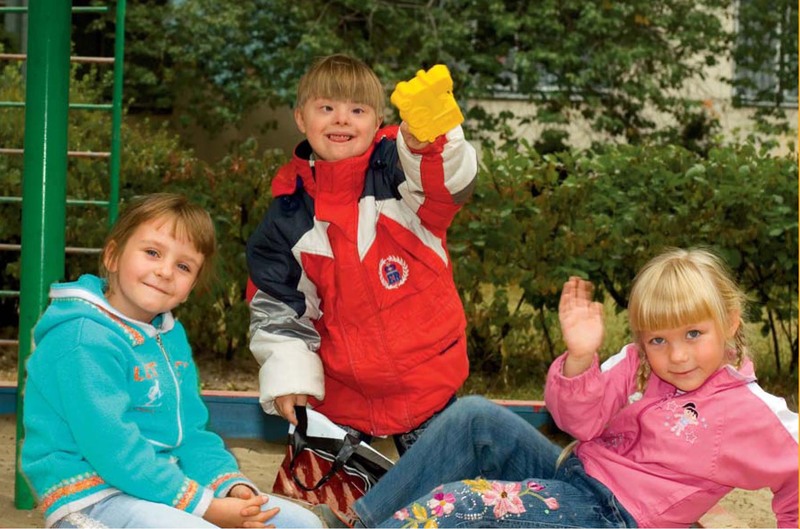 Teaching and upbringing methodology applied at the named inclusive groups is based on the experience of similar ones which function in CIS, Poland, Canada and USA. As all we do, children with DS also have the rights for worthy life and education. We believe that inclusive kindergartens in Kyiv are only the beginning, the first step in the development of inclusive preschool education in Ukraine. Speaking about the model of professional support for the family who cares of child with DS, it’s implementation starts within a maternity house and continues with the Home Visits program. Then, and at the age of 12-18 months old toddlers attend special training programs (such as Small Steps, minikindergartens) at which our therapists, pedagogues and psychologists help them to stimulate their development and adopt social norms. At the age of three, children who get prepared within the previous stages of the model, move up to the inclusive kindergartens mentioned above. The plans of our organization for the next year provides establishment of inclusive programs at general education schools, and in several years - in vocational schools.